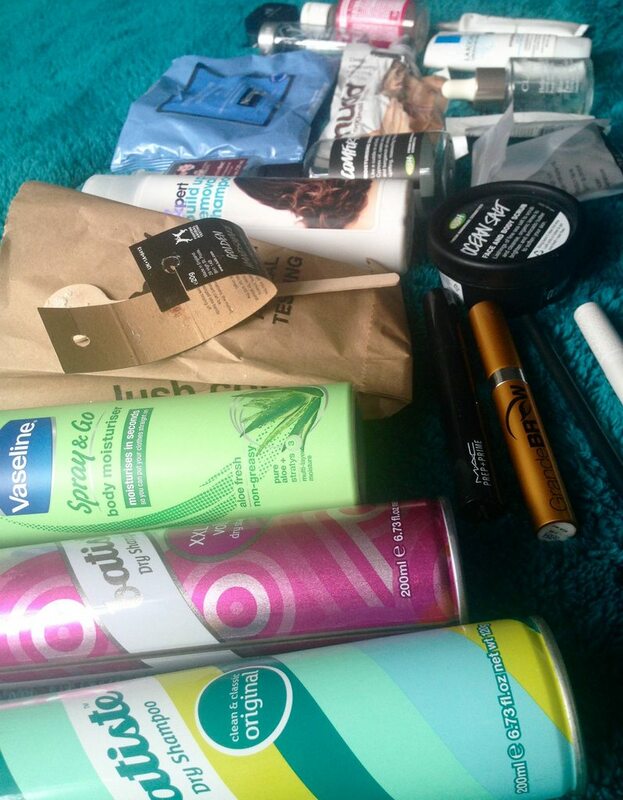 September – December Empties! | Becky Alyssa's Beauty Box. 1. 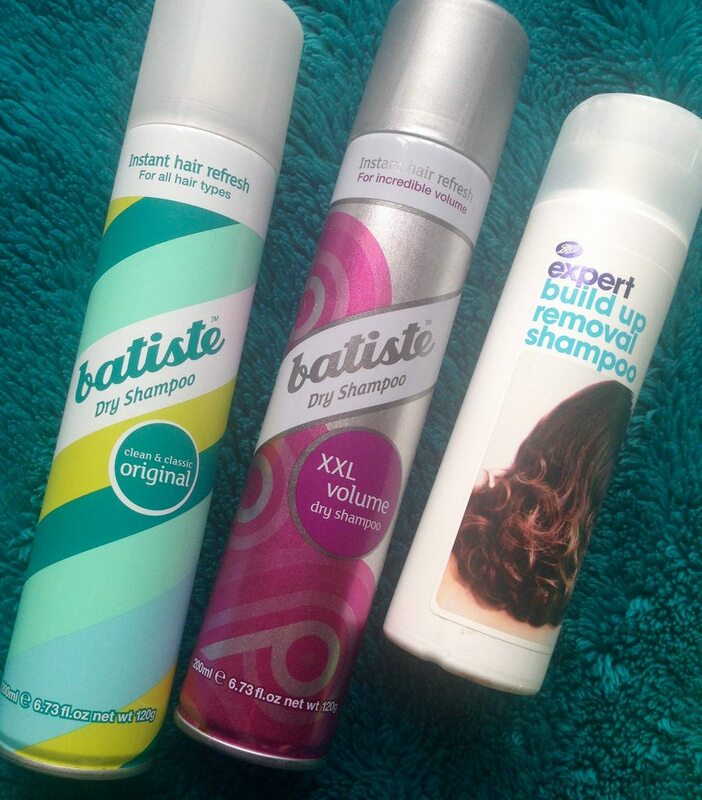 Batiste Dry Shampoo in Original (£2.48 via Superdrug) – Looks like Batiste packaging has changed yet again! I only wash my hair every 3-4 days so dry shampoo is a must to prevent it looking too greasy. I use this on the mid-sections and ends of my hair to give it the illusion of being soft and fresh, and use a more volumising product at the roots. I actually prefer the smell of this one to most of the others – it’s quite clean and fresh without being too strong, I can’t stand scented hair products that compete with your perfume. An essential that does the job for me, and doesn’t cost a fortune! Repurchase? Yes. 2. Batiste Dry Shampoo in XXL Volume (currently unavailable) – Slightly worried this HG essential is being discontinued, as I can no longer find it online! All I can find is an ‘improved formula’ which contains oils – why would I want extra oils on my roots?! Lots of people seem to dislike this product, as it’s easy to go overboard on first use and end up with tangled sticky hair, but just a few small sprays at the roots gives a great boost of volume whilst also absorbing excess oil. Repurchase? Yes, if possible. 3. Boots Expert Build-Up Removal Shampoo (currently unavailable) – Sigh..another discontinued hair product?! Okay, I’ve had this one a while – the packaging is practically ancient! The latest version came in a very muted, ‘classic’ looking slim cream bottle with silver and black print – really hard to spot on the shelf, even if you were looking for it. I prefer the old packaging! Although I don’t use this much, especially with coloured hair, it’s ideal for removing excess product (I’m a big dry shampoo fan as you can see) and keeping hair clean and healthy. I always follow up with a deep conditioning mask to avoid drying my hair out. This was totally affordable and did the job – any other recommendations? Repurchase? Yes, if possible. 4. Vaseline Spray & Go Body Moisturiser in Aloe Fresh (£2.45 via Superdrug) – I actually just finished this one up this morning! Ideal for warm days in the summer, but this doesn’t get much use for me in winter as I’m normally far too cold to mess around with lotion in the morning! Ideal for anyone who’s bad at body moisturising, as this is so fast and easy to apply, sinking in almost immediately without leaving any sticky/greasy residue at all. I find the Aloe scent is the most mild and non-offensive, as it just smells light, fresh and clean! Repurchase? Yes. 5. Lush Ocean Salt Face & Body Scrub (from £7.95 via Lush) – A tiny size from a gift set last Christmas! This was my first time trying out Ocean Salt, & I really enjoyed it. The zesty, clean smell is so refreshing, the coarse sea salt gives a good scrub without being overly abrasive, and avocado butter softens your skin at the same time. Not to mention, like everything else Lush it’s completely natural. I rarely purchase body scrubs for myself as I enjoy my Salux so much, but this was a lovely one to try out! However it’s very expensive for a scrub so not sure I’d repurchase right away! Repurchase? Maybe in the future. 6. Lush Comforter Moisturising Shower Cream (from £4.95 via Lush) – I was thrilled that Lush released a Comforter-scented shower product, since I love the bubble bar so much! Unless they’ve been reformulated since I purchased earlier in the year, I feel it does smell a little more sugary than the classic bubble bar, not to mention the shower cream formula can be a little gritty. I also find that if my skin is quite dry, these stain as they’re so pigmented! I had this issue when on holiday in the summer, as my underarms were so dry from regular shaving. I do prefer the shower gel formula I managed to snag in the Lush Kitchen, & will most likely repurchase when I’m all out of the gel too, as the smell can’t really be beaten. Repurchase? Soon! 7. Bath & Body Works Japanese Cherry Blossom PocketBac ($1.75 via Bath & Body Works) – One I’ve had around for a while – it does take me ages to finish these up! I always have a selection of different scents to throw into bags whenever I go on a trip, as they’re essentials if you’re using public transport (or just out in public in general). I did used to love the pretty floral Japanese Cherry Blossom scent but now it’s a bit strong for me. Repurchase? Yes, in another scent. 8. Lush Golden Handshake (£2.95 via Lush) – I’d bought this to use for both my hands and feet before going on holiday. After following the instructions, it was nothing like the creamy paste pictured on the website – the product barely melted & just remained as chunks floating around. I’d definitely recommend using in boiling water and just leaving to cool, as hot tap water as mentioned in the instructions isn’t quite adequate (at least where I live). It was a bit frustrating (and messy) & I would have got the same result just using a hand & foot cream! Repurchase? Probably not. 9. Dr Bronner’s Organic Rose Castile Liquid Soap 59ml (£1.99 via Dr Bronner’s UK) – I used this one for washing my brushes! I’d heard a lot of good things about it, so decided to try it out. However I’m not sure I’m a fan – although the rose smell was lovely, the soap felt drying on my skin and still felt like it left a slight film on my brushes. Think I’ll go back to using baby shampoo! Repurchase? No. 10. MAC Prep & Prime Lash (£13.50 via MAC Cosmetics) – Unfortunately this didn’t really seem to do anything for me! Whilst good lash primers give the look of length and definition, this didn’t seem to do anything. Also it didn’t dry properly at all – a shame when MAC products are so expensive! Repurchase? No. 11. MAC Pen in Lingering (£14 via MAC Cosmetics) – ..Wait, has this always been £14?! I swear it used to be less! Though I can’t complain too much when it keeps my brows nicely filled whilst still looking natural due to its super-fine tip and lovely taupe shade – no ugly orange-brown brows over here! My only complaint is that I do go through them very fast! Repurchase? Yes. 12. Tarte Opening Act Lash Primer [Deluxe Sample] ($22 for full size via Sephora) – I wish it was easier to get such great samples & mini sizes for free over here – god I love Sephora! I probably wouldn’t have even considered this product otherwise. It really does give great length and definition under regular mascara and I definitely see a difference whenever I use it. I made sure to pick up the full size on my last visit! Repurchase? Already did! 13. 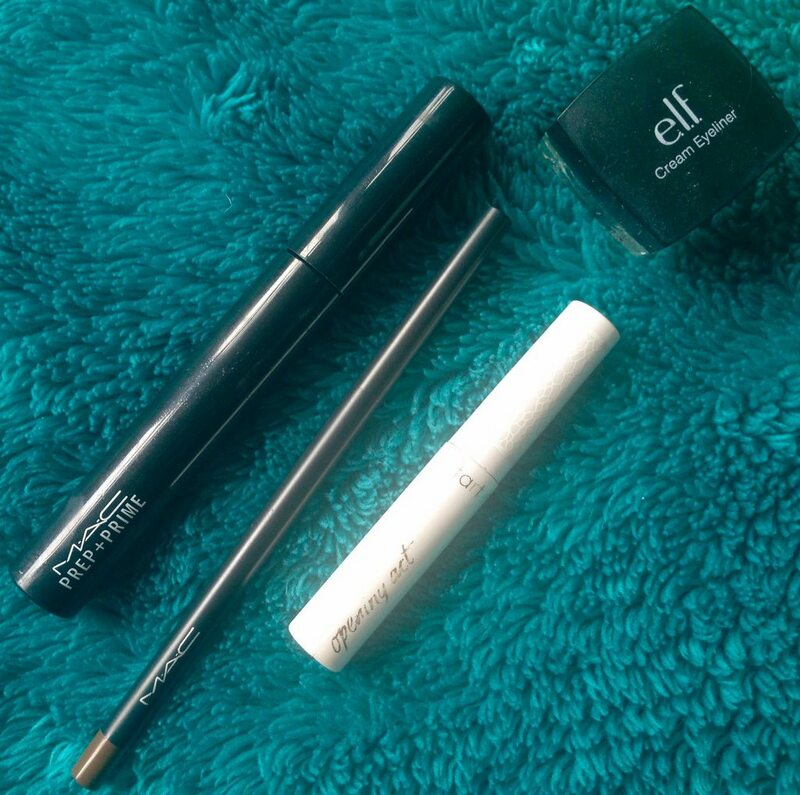 ELF Cream Eyeliner in Black (£4.50 via ELF UK) – I didn’t quite finish this one up – it’d dried out so I had to get rid of it sadly! Though I just stick to felt tip style eyeliners these days, as they’re just easier and less messy. If you do use cream or gel eyeliners, this is so similar in formula to the MAC Fluidline liner and works just as well – a great product for the price, but just one I don’t use anymore! Repurchase? No. 15. Indeed Labs Eysilix Instant Eye Rescue (£24.99 via Boots) – My favourite eye cream! I don’t enjoy the idea of paying £25 for an eye cream, so I always purchase when they’re on sale in Boots, or search for a new one on Ebay. This is probably the only one I’ve used where I’ve actually noticed a difference in smoothing out fine lines under my eyes, which means both my skin and my makeup look better. It doesn’t give me those horrible milia spots either, which are often caused when creams are too rich for your skin type. I’ll keep repurchasing if it keeps up such great results! Repurchase? Yes. 16. Lancome Bi-Facil Eye Makeup Remover [Deluxe Mini] (£17.95 for full size via Amazon UK) – I used to use this regularly and loved it, but I’ve had this one such a long time so thought it best to get rid of it! The oil-based formula is ideal for quickly breaking down tough waterproof mascara, but now that I use an oil-based cleanser I rarely need to use a separate eye makeup remover. I also found this leaves an oily film behind, so I tend not to reach for it anymore. Repurchase? No. 17. Mudd Original Mask [5 application pack] (£3.06 via Amazon UK) – My HG face mask! I’ve been using this for a few years now & it’s still just as effective as ever. It does a brilliant job of drawing dirt out of pores, leaving the skin smooth, soft and clear without being overly drying or irritating sensitive skin at all. And it’s great value – a decent face mask doesn’t need to cost a small fortune. Repurchase? Yes. 18. Elizabeth Arden 8 Hour Cream Lip Protectant Stick (£11.69 via Amazon UK) – The first time I’ve ever finished a lip balm! *cue confetti* A new HG for me – many lip balms just seem to make my lips even drier; this is one of the few that actually seem to help and ensure my lips don’t feel dry during the day, especially in the chilly winter weather. The only con is that the RRP price of £20 is a bit crazy for a lip balm, and that it’s quite a soft formula so seems to get used up very quickly! Repurchase? Yes. 19. Sunday Riley Good Genes Serum [Sample] (£85 for full size via Space NK) – One of the many little samples of this wonder I picked up from Sephora. I know I went on about it in my Sephora haul so I’ll keep it short and sweet – an absolute wonder serum for keeping skin smooth and youthful-looking without irritation, seeming to solve a wealth of problems for me. Just a shame about the crazy price tag! Why must some expensive products be so amazing?! Repurchase? Yes (when I can afford it). 20. Fresh Rose Hydrating Eye Gel Cream [Sample] ($40 for full size via Sephora) – A little sample sachet that lasted quite a few days! This thick cooling gel product felt so soothing on the skin and left my undereye area quite moisturised; however it didn’t do anything incredible, especially for the price. I’d try others first! Repurchase? No. 21. Clarins Blue Orchid Face Treatment Oil (£29 via Escentual) – My go-to oil for when my skin’s feeling particularly dehydrated (which is all too often). Quite a pricey option but absolutely worth it – mine lasted me a few months, and never breaks me out or makes my skin appear overly greasy. I use this under my REN Frankincense night cream, a brilliant nighttime combination for sensitive/dehydrated skin in the cold weather. Repurchase? Yes. 22. La Roche-Posay Hydreane Legere (£9 via Escentual) – I’ve lost count of how many of these I’ve used up! My favourite daytime moisturiser for my sensitive dehydrated skin. Free of oil, fragrance and colouring, it never irritates my skin or looks greasy. Just lightly hydrating & very effective for troubled skin in the daytime. Repurchase? Yes. 23. GrandeBrow Brow Enhancing Serum (£39.50 via StrawberryNet) – Extremely expensive, but a must-try for anyone else who has sparse brows because of over-plucking, accidents or genetics. I used this one up until it was completely dry – it’s the first growth serum I’ve tried that actually works. I started seeing results within a couple of weeks and my brows really improved, though I wasn’t able to get hold of one for a while and I believe you’re supposed to apply weekly or so once you’ve achieved the brows you want. My brows are very sparse partly due to an unfortunate accident as a child on one side, and partly due to overplucking. I’m trying again with a brand new tube and hopefully I can get them to grow nice and full again! Repurchase? Yes. 24. Bumble & Bumble Thickening Dryspun Finish 40ml (£9.50 via Feel Unique) – A useful little texturising spray for travel – I used it up over my last couple of trips. I found it only gives light texture to the hair, not much more than a dry shampoo would. It was just okay, & in the meantime I’ll try something else! Repurchase? No. 25-26. More Neutrogena Makeup Remover Cleansing Towelettes and Batiste Original Dry Shampoo – see above! 27. Elizabeth & James Nirvana White Perfume [Sample] (from $25 for full size via Sephora) – A tiny sample size which lasted several uses! Nirvana White is one of my all-time favourite scents, a gorgeous peony and musk which is gorgeous to wear in warmer weather (or any weather really). It always reminds me of holidays, so very appropriate to take with me! I love the White version & have recently become a fan of the Black, a new favourite of mine for winter and evenings. Repurchase? Yes. 28. Kleenex Shine Absorbing Sheets (currently unavailable) – I use up SO many of these! Very similar to the Clean & Clear blotting sheets – an essential for me as my skin gets very oily through the day. I’d recommend them to anyone else looking for decent, effective blotting sheets which don’t take off half your makeup with them! Repurchase? Yes (if possible). 29. 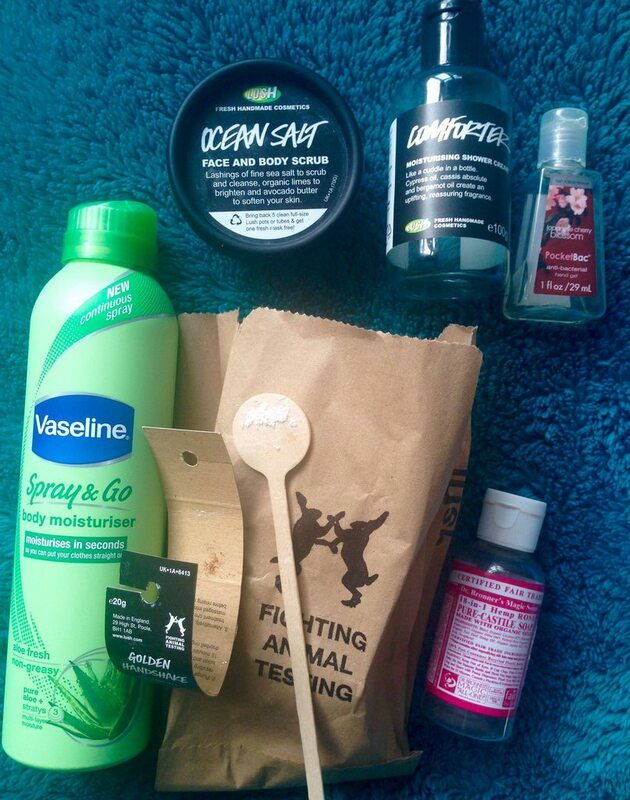 Lush The Olive Branch Shower Gel (from £4.95 via Lush) – My last empty of 2015! Olive Branch is an old favourite of mine but I hadn’t used any in ages. The gorgeous smell and ultra-moisturising formula makes it a pleasure to use in the shower – skin feels silky soft afterwards, even without lotion. My boyfriend mentioned it smelled amazing too (slowly converting him to Lush). Anyone who’s never used it needs to try it! 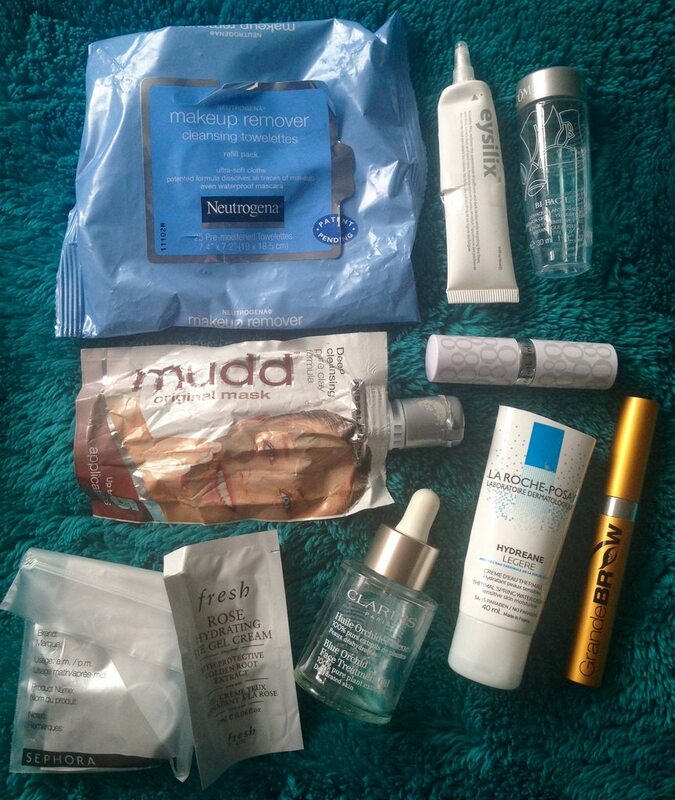 So those are my last Empties for 2015 – I hope you enjoyed seeing what I used up! Remember to let me know what you’ve used up below, & if you have any favourites from my list! ← A Container Store Travel Beauty Haul! Thankyou, I appreciate it! 🙂 Following you too!